Beijing is preparing new emissions standards for vehicles, but localized measures won’t solve the city’s smog problem. The municipality of Beijing is preparing to introduce new standards for vehicle emissions. But plans to tackle smog in the capital, before the arrival of the Winter Olympics in 2022, have been thwarted by lax environmental regulations elsewhere. A final version of the ‘Beijing VI’ standards is expected later this year following a public consultation that started in 2015. The reforms are expected go further than pre-existing national regulations (‘China V’) to cut petrol vehicle emissions by 40-50 percent in the long-term. 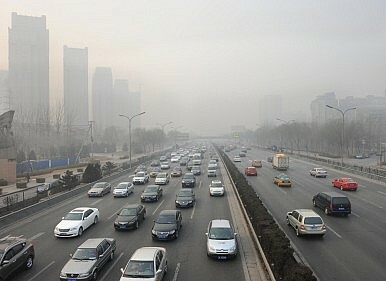 However, polluting vehicles and machinery from outside Beijing will still be allowed to enter the capital with impunity. Tougher emissions standards for new cars will only apply to vehicles sold in Beijing, a large market in its own right but dwarfed by sales nationwide. Car and truck pollution is estimated to be responsible for around one-third of Beijing’s smog, with the rest coming from industrial sectors, in particular coal industries and construction. The incoming Beijing VI covers light-duty and heavy-duty vehicles, as well as heavy-duty diesel and petrol machinery. In common with the Beijing V (which also applies to diesel), it will limit the sulfur content of fuel to 10 parts per million (ppm) while restricting the level of harmful hydrocarbons found in fuel. The Beijing Environmental Protection Bureau estimates that by 2020, 50 percent of vehicles in the city will meet the Beijing VI standards, resulting in a 20-30 percent drop in the volume of harmful particulates such as PM2.5 and nitrogen oxide in the air. Last year’s emissions scandal involving German car-makers Volkswagen, which had been using rigged devices in emissions tests, highlighted the need for higher emissions standards across the industry. Michael Walsh, adviser to the International Council on Clean Transportation (ICCT), told chinadialogue that the Beijing authorities will need to start spot testing vehicle emissions on the road, as well as in laboratory conditions. Walsh hopes to see the Ministry of Environmental Protection use China’s new Air Pollution Law and new vehicle regulations to enforce a recall system that will see offending production lines shut down and polluting cars taken off the roads. “Now we’re going to see if China is serious about dealing with vehicular pollution,” he said. China’s central government plans to take Beijing’s cars reforms nationwide in 2020, in the form of the ‘China VI’ standards. But until that time, up to 100 million cars that are subject to slacker standards are expected to be sold. The policy is therefore unlikely to be a catalyst for the widespread adoption of greener cars in the way that California’s vehicle emissions standards have been in the United States. Pollution experts have suggested skipping China V and moving directly to the China VI. But implementation of China V has already been announced and manufacturers have already invested in bringing production into line with national criteria. Moving to the China VI now could be disastrous, say some businesses. Tang Dagang, former head of the Ministry of Environmental Protection’s Vehicle Emissions Control Center, suggests that a U.S.-style approach is adopted, where new car regulations have been rolled out incrementally. In the first year, 10 percent of cars have to meet the new national standards, in the second year 30 percent, in the third year 50 percent, and so on. The Chinese government also intends to improve the quality of fuel, such as better regulation of the type of products coming from Chinese refineries. A rapid shift to electric vehicles could help alleviate the impact of direct emissions from combustion engines. But according to new research from Tsinghua University, powering up battery-operated cars might inadvertently contribute to smog by placing extra demands on a mainly coal-reliant grid. Plans by Beijing’s city government for tighter standards on diesel vehicles are a response to what are regarded as weak national standards, which levy lower penalties on diesel compared with petrol cars. Diesel vehicles have become increasingly popular in the past few decades because of they are cheaper to run than their petrol equivalents, while in Europe, policymakers encouraged their use because they emit less CO2 than other types of combustion engines. The ‘Beijing VI’ standard would require high-efficiency diesel particulate filters (DPFs) to be fitted to all vehicles, bringing exhaust emissions below those permitted by the EURO VI level applied in the EU. And the city has already tightened diesel standards with new requirements for engines and emissions control devices, such as catalytic converters, DPFs, and NOx ‘traps’, prompting large reductions in nitrogen oxide emissions. The addition of diesel particulate filters will reduce particulate emissions even further. As 70 percent of vehicular nitrogen oxides and particulate matter comes from diesel engines, these measures would, in theory, greatly reduce vehicle pollution. However, the problem remains that diesel cars emit far more harmful particulate matter than petrol cars. There is little hope that all older vehicles (which usually produce higher emissions) will be retrofitted with new equipment. And for those that can be upgraded, it will take time. In 2014, Beijing had 5.59 million vehicles on the road, 4.37 million of which were privately owned. Every year, 150,000 new vehicles are registered in the city. Vehicle emissions are determined by the size and nature of the engine, as well as exhaust gas devices. In general, engine efficiency declines as a vehicle ages. When exhaust gases fail to reach high enough temperatures, the efficiency of emissions control devices deteriorates. Additional threats to the effectiveness of new vehicle standards come from vehicles registered outside of Beijing, and from off-road industrial machinery. Every night, fleets of trucks carrying fruit, vegetables and building materials drive into the city, spewing exhaust fumes as they go and causing a small night-time peak in PM2.5 levels. Some diesel trucks have emissions several hundred times higher than a Beijing V-compliant car. As most of these are registered outside the capital, they are not subject to Beijing’s rules. For Beijing to win the war on smog it must join forces with its neighboring provinces and launch a coordinated attached before the 2020 deadline. This post was originally published by chinadialogue and appears with kind permission. Thanks to the Clean Air Alliance of China for assistance with this piece. Beijing issues a red alert warning on pollution.